Popchips CEO apologizes for "light-hearted parody." 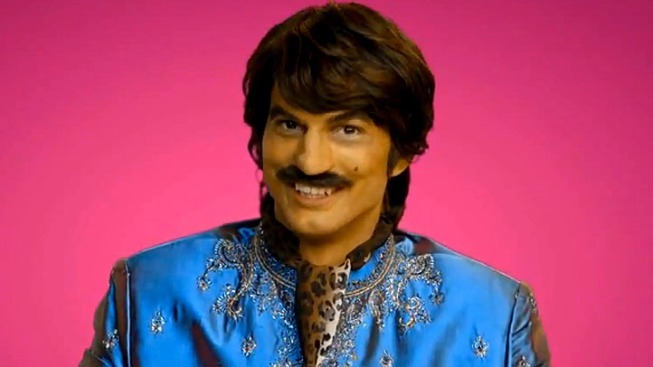 Ashton Kutcher in brownface playing Raj, a 39-year-old Bollywood producer, in the controversial ad. Ashton Kutcher’s new “brownface” ad has been pulled and the CEO of the company whose product he hawked has issued a red-faced apology. The “Two and a Half Men” star’s new advertisement for Popchips was taken down from the Internet within a day of its release amid complaints it was racist. The ad, which parodied a dating service, went online on May 2, and was removed Thursday morning amid a firestorm of criticism on the Internet, The Huffington Post reported. “I can’t imagine I have to explain this to anyone in 2012, but if you find yourself putting brown makeup on a white person in 2012 so they can do a bad ‘funny’ accent in order to sell potato chips, you are on the wrong course,” Indian-American tech entrepreneur Anil Dash wrote on his website. New York rappers Das Racist also slammed the ad. “Hey if you care, call popchips at 18662179327, hit 2 and register your concern, they got to pull this s*** and apologize,” he tweeted to his nearly 34,000 followers. Keith Belling, founder and CEO of Popchips, issued an official apology for the ad on the company’s website. While the full-length ad featuring Kutcher playing Raj was removed from Popchips’ Youtube channel, Raj is still included in a compilation ad online, which shows Kutcher playing Raj as well as several other characters. Kutcher has not yet responded to the controversy.